Native to Australia and New Zealand, Eleocharis pusilla dwells in wetlands with different water levels. The growth height is considerably shorter than Eleocharis acicularis, usually only a few centimeters tall. Another unique feature of this dwarf spikerush is that the stems are light green and slightly curved. This species fairs best in a cooler environment; it cannot tolerate constant high temperatures over 77° F. This delicate beauty is especially well suited to stone setups in the Iwagumi style, for the creation of a fresh "summer meadow". Like Echidonorus acicularis, Eleocharis pusilla can also be trimmed well back, which makes the grass even thicker and more compact. In Vitro specimens are submerged in 100% humidity. Many aquarium plants available are emersed, which means the leaves are growing above the water. These plants die back after they are planted inside a tank, and they regrow with the new foliage looking different than they did when they were sold. 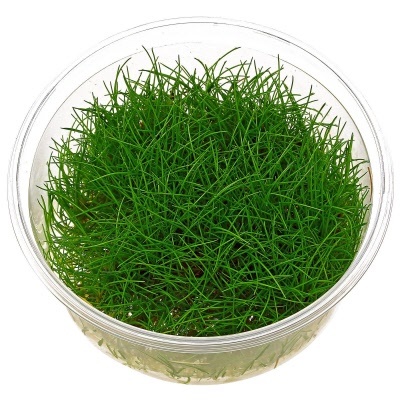 With In Vitro submersed plants, you get steady, uninterrupted development.